The crossover was first made known around the time that the Simpsons/Family Guy crossover, which also airs this fall, was first announced. This week, Simpsons producer Al Jean confirmed the Futurama episode at a Television Critics Association panel this past weekend. In the episode Bender is sent back in time to kill Bart Simpson, who did something that severely messes up the future. Futurama voice cast Billy West, John DiMaggio, Katey Sagal, Maurice LaMarche, Phil LaMarr, Lauren Tom, and Tress MacNeille will be featured in the episode. 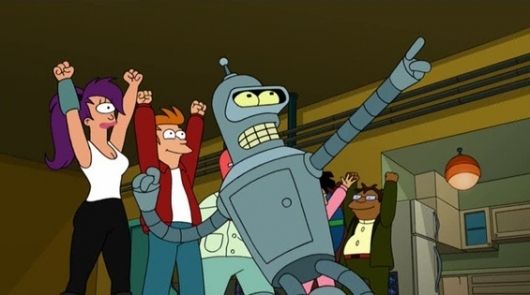 It’s no secret that Groening and co-developer and executive producer David X. Cohen still have hopes that some other network or streaming service will pick up Futurama for new episodes in the future. Hopefully, if its popularity alone isn’t enough to make this happen, this crossover episode with The Simpsons will boost the chances.